A great adventure you can enjoy in your stay at Gaia guesthouse, all year round and for all ages!! We have created Special Packages* for the guesthouse and most of them include Rafting as an all year round activity ! One of our favourite acivities since Epirus is well known for its bridges and rivers!! That is why we made sure that, with your stay at Gaia, you will be able to experience the two most important rafting routes with our partners Alpine Zone! 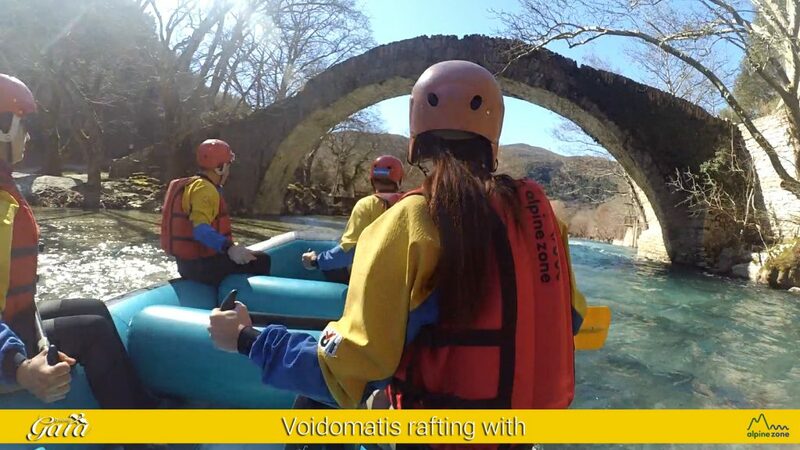 Early March we did document both routes and now you can get a taste of the first one, Voidomatis river route! Distance: 5 klm from Aristi Bridge until the Bridge of Kleidonia and then 500 m for the base camp. Duration: 1 hour & 45 min approximately (untill end of May) Summer time is approximately 2 hours due to low water levels. Total duration 3-3.5 hours depending on how many people are joining. Every boat takes up to 8 people plus the coach in high waters and in the summer up to 6 people. Ages: from 2 y.o. till 95 ! It has to do with the spirit! Only in the winter there is the exception of really young kids because of the extreme low temperatures. Equipment: The equipment needed is in the package as Alpine Zone provides everything for your safety. It can also be combined with guided tours of Zagoria or in the summer canyoning to natural pools of Rogovos. Voidomatis promo Gaia Guesthouse from Gaia Guesthouse on Vimeo. Voidomatis (Greek: Βοϊδομάτης) is a river in the Ioannina regional unit in northwestern Greece, and is a tributary of the Aoös river. The main current sources are located under the village of Vikos. Along its path it converges with other water currents originating from the banks of Tymfi or the Vikos Gorge it ends close to Konitsa. The river has a total length of 15 kilometers. The name Voidomatis,(meaning: the eye of the ox), derives from the fact that oxen have clear blue eyes, like the waters of this river. Also, there is the Slavic etymology: Bode–Mat which means “good water”. Voidomatis has been characterized as one of the cleanest rivers in Europe as it does not face any environmental issues. It crosses one of the most beautiful natural locations of Greece and has been part of the Vikos–Aoös National Park since 1973. The river is spanned by a number of stone bridges, the most famous being the Kledonas Bridge. The river is known for water sports such as rafting and kayaking. The Voidomatis is mostly seasonal, with year-round flow. The average temperature of the water does not exceed 4 °C. * the special prices are not valid on important holidays.